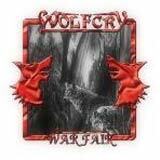 Wolfcry is a very enthusiastic Greek power metal band, with Warfair being their third full length album. The band has progressed with their songwriting, although I still feel the guys have a way to go before I would classify them as a first tier type of band. They've taken their classic heavy metal sound, and added some progressive, and even some death elements (used sparingly) to their sound. In general, I like how the band is growing and defining their identity. Blazing guitar work still forms the backbone of Wolfcry's sound. Chunky, driving riffs carry each of the songs, occasionally borrowing from the Judas Priest and Iced Earth school of classic riffage. Passionate, well performed solos generously grace the album from start to finish. The rhythm section is right there, filling out this forceful wall of sound. The drummer is able to deliver pounding double kicks, but also comes up some some creative fills along the way to keep things from getting predictable or monotonous. Musically speaking, I got a strong sense that the musicians are putting a ton of passion and energy into their performance. For me, that extra bit of passion is an intangible ingredient that means a lot to me. I've heard technically brilliant albums in the past that just seem to lack emotion or character. Despite the technical brilliance, I likely won't revisit such an album very often. Now, give me an album that might not be on such a technical pedestal, but is played with heart, and I'll be very likely to spin that album frequently. Wolfcry have that sort of inspired chemistry about them, and it shows in their energetic music. While that intangible isn't an end all, be all of success, it's a big feather in their cap in my opinion. Having said all that, the lead vocals are quite subdued compared to the rest of the music. The man sings with emotion, yet his range is very limited and his voice not all too powerful. Instead, his delivery is mostly soulful and smooth. He doesn't make any mistakes, and quite frankly, he does what he does very well. My only concern is that the intensity of the music itself proves to be a somewhat unnatural mix for this type of vocalist. With ferocious guitar work and a galloping rhythm section, I'd expect someone a bit more flamboyant and intense behind the mic. As a result, I think the songs miss the mark a bit when it comes to urgency; the vocals just sound unconvincing stacked up against the music at hand. However, the band does introduce some intense, almost death metal vocals from time to time. In fact, almost the entire track 6 Must Die is performed with extreme vocals. I have to say that this seems to be more of a natural sound for the band, and they make it work very well here. You'll also hear some of these vocals scattered throughout other tracks such as Hesitant Gathering and The Mirror Mask. I am quite pleased with the results, it flows quite naturally. With this album, the band has taken the keyboard layering a bit further. For the most part, they add a Kamelot style of progressive feel to the music, but there are spots when they are overbearing. That's only a small issue for me really, as the keys do add some much appreciated personality and atmosphere to the music. This album will take a few listens to really get into. The melodies are not very obvious, and are in fact quite subdued. Also, the riffs are well played and energetic, yet they aren't of the instantly recognizable variety. Wolfcry is instead relying on their songwriting and strong musicianship as a recipe for success. In that regard, I think the album holds its own very well. Yes, some songs are better than others, and so the use of some catchy elements would have helped the lesser songs. Wolfcry have a lot of talent and great ideas to work with; Warfair is certainly a good album. As I've pointed out, there are some areas in which I think the music could be even better. I like the fact that their sound seems to be progressing with time. It's obvious that the band finds great inspiration in making their music, and play with heart. With that, I have no reason to believe that Wolfcry won't eventually produce more than just "good" albums.